We’ve done it again! We’ve been shortlisted for three Kent Invicta Chamber of Commerce Business Awards. Once again, we entered three categories: Entrepreneur of the Year, Business of the Year and Excellence in Customer Service. And once again, we’ve been shortlisted for each one! The Kent Invicta Chamber of Commerce hold business awards annually. This is their 9th year of running the awards that are open to businesses in Kent, whether or not they are members of the Chamber. The entry forms asked us about our business successes, initiatives and targets for the future, and how these will be achieved. Being shortlisted for all three categories that we entered is a great testament to how well we’re doing. The winners will be announced during a gala dinner at Canterbury Cathedral Lodge on 26th March. 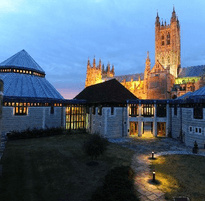 The Cathedral Lodge is a beautiful venue within the grounds of Canterbury Cathedral. Last year, we were the first company to be shortlisted for three categories, so now we’re the first company to be shortlisted for three awards, two years in a row! We’ll certainly have all our fingers and toes crossed for this year!